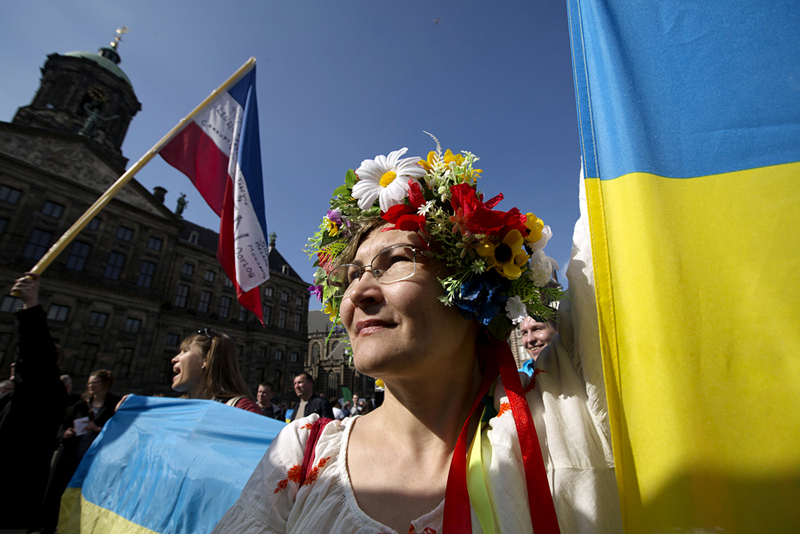 A Ukrainian woman stands in front of the Royal Palace during a demonstration on the EU referendum, at the Dam Square in Amsterdam. Russian presidential press secretary Dmitry Peskov has categorically dismissed accusations leveled at Russia that it is trying to affect the outcome of a referendum in the Netherlands on the ratification of the EU-Ukraine Association Agreement. "The trend toward looking for Moscow's hand may only cause a smile with slight disappointment," Peskov told journalists on April 6. "It's true that we are following the situation in Europe as a whole, and we are certainly following news on the results of this referendum. We know that it is recommendatory," Peskov said. However, "this is the Netherlands' internal business," Peskov said. "We don't see fit to sway the Netherlands this or that way or recommend it anything. Russia has never allowed itself to do this. Surely, we cannot interfere in Ukraine's sovereign relations with its European partners. In fact, we have never done that," Peskov said. The referendum on the Ukraine-EU association is taking place in the Netherlands on April 6. The only question for the referendum is "Are you for or against the ratification of the association agreement between the EU and Ukraine?" Its results will be advisory and not mandatory for implementation by the Dutch government.